This is an old favorite recipe of mine that underwent a “meal makeover” with the Meal Makeover Moms Janice and Liz, making it not only easy and tasty, but healthy, too! I won a meal makeover consultation a month or two ago, and I had a blast chatting with Janice and Liz on the phone in April as we discussed some of my recipes that might need a little healthy boost. This ended up being the recipe that stood out the most. I made the new and improved Chicken Cordon Bleu for my family last week, and everyone loved it, even my teen who normally doesn’t like the swiss cheese-ham combo on her chicken. She asked for seconds and then had some for lunch the next day. Score! The flavor of this dish shines thanks to the Holland House cooking wine. Our families enjoy this saucy dish with brown rice and steamed broccoli florets on the side. You could also serve it with whole grain noodles and just about any other veggie: peas, asparagus, carrots … you name it. Place ½ cup of the flour, the pepper, and salt in a large bowl and stir to combine. Toss the chicken in the flour mixture until each piece is well coated. Heat 1 tablespoon of the olive oil in a large Dutch oven or saucepan over medium-high heat. Add half of the chicken pieces and cook until golden brown, about 2 minutes per side. Remove to a plate and repeat with 1 more tablespoon oil and the remaining chicken. Adjust the heat to medium if the chicken browns too quickly. Remove the chicken to a plate when done. Lower the heat to medium. Add the remaining 2 tablespoons of oil, the remaining 3 tablespoons of flour, the basil, paprika, and celery seed and whisk constantly until smooth, about 2 minutes. Whisk the cooking wine into the flour mixture until well incorporated and the wine has cooked off a bit, about 1 minute. Whisk in the milk and broth until well combined. Raise the heat and bring to a low boil, stirring constantly. Reduce the heat and continue to simmer and stir gently until the mixture thickens, 2 to 3 minutes. Stir the chicken and ham into the milk mixture and simmer, uncovered, until the chicken is cooked through and no longer pink, about 10 minutes. Stir occasionally. Remove from the heat, stir in the cheese until it melts, and serve on individual plates with your favorite vegetable and whole grain starch. Janice and Liz also made a video of the recipe for those of you who do well with visual cues. A huge thank you to the Meal Makeover Moms for everything! Oh yummy yum yum! I’ll be over for dinner at 6. LOL!!! I’m so glad you and your family loved the recipe. My boys love it too. The ingredients come together beautifully .. and the dish goes well with just about any veggie. Yippee!! Ohh this looks so yummy! What a cool prize that you won! And the dish sounds yummy! Yummy! I am a huge fan of chicken cordon blue but not the calories. This sounds delicious. I love making over meals to make them healthier! Yummy! 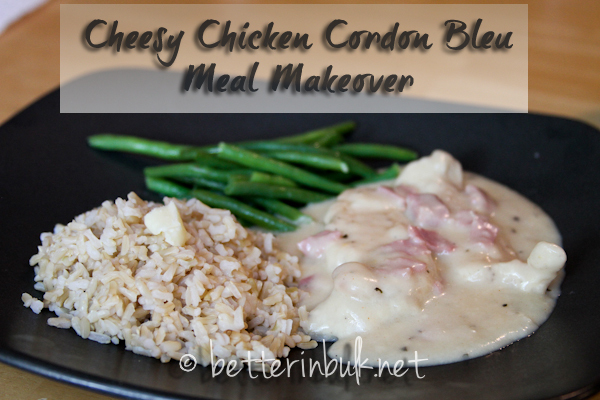 Chicken Cordon Bleu is one of my favorites! Love that this is healthier! I love the concept of healthifying a favorite! &Yum! Oh how cool that you won that consultation. That looks absolutely delicious. awesome! this is a long time family favorite. my dad used to order it every time we went to a restaurant!